Introduced in April 2003, the Cargo-Tram service offers a car-free alternative to Zurich residents who need to dispose of their bulky waste. In 2006 the E-Tram started a similar service for the removal of electrical and electronic waste. Today, cargo trams make about 18 round trips every month. The service is free of charge. How do you get rid of a worn sofa in Zurich? Until April 2003 the answer was simple: take your car, drive to the dump burning power plant and pay 20 Euros. Another possibility was to call the urban bulky waste service, pay 27 Euros and wait until it got removed from the street. Since April 2003, the situation of Zurich residents improved: they carry the sofa into the next bus or tram and drive to one of the 9 Cargo-Tram pick-up points and leave it there, for free! Workers of the "Remove and Recycle' program will then fill two containers with dump and bulky waste, which is afterwards brought to the dump burning power plant. ERZ (Entsorgung und Recycling Zürich) is the city refuse disposal service. In Zürich, bulky waste can be collected at a charge, or left for free at one of the two ERZ yards. The idea of a freight tram was developed with the objectives of having a more attractive and inexpensive collection service as well as to avoid private car trips to disposal yards, ERZ lorry door-to-door trips and illegal dumping of bulky waste items. The project was developed in collaboration Verkehrsbetriebe Zürich- VBZ, the city public transport operator. The Cargo-Tram makes use of two adapted refuse containers carried on four-wheeled flat wagons and hauled by an old works tram. 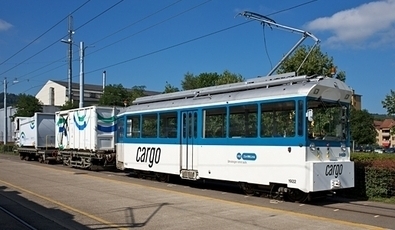 VBZ invested 25,000 Euros for the adaptation of containers, tram’s livery and the low cost infrastructure of the stops. Cargo-Tram costs around 1,000 Euros for every working day. Consigned items may not be longer than 2.5 meters and no heavier than 40 kg per piece. Since January 2006 another adapted freight tram called E-Tram was introduced for the disposal of electronic and electric waste. Today Cargo-Tram and E-Tram makes 18 round trips every month, with each trip serving one of the 9 pickup points. Cars do not have any access to the 9 stops during their working hours (from 3 pm till 7 pm). It's not surprising that Zurich introduced the Cargo-Tram and E-Tram for its residents: the city, with its 385,000 inhabitants, has 165 kms tram network and actually 43 per cent of household waste remain in the recycling process.